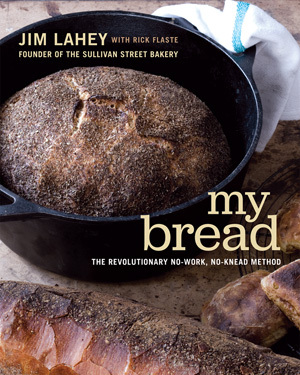 When he wrote about Jim Lahey’s bread in the New York Times, Mark Bittman’s excitement was palpable: “The loaf is incredible, a fine-bakery quality, European-style boule that is produced more easily than by any other technique I’ve used, and it will blow your mind.” Here, thanks to Jim Lahey, New York’s premier baker, is a way to make bread at home that doesn’t rely on a fancy bread machine or complicated kneading techniques. The secret to Jim Lahey’s bread is slow-rise fermentation. As Jim shows in My Bread, with step-by-step instructions followed by step-by-step pictures, the amount of labor you put in amounts to 5 minutes: mix water, flour, yeast, and salt, and then let time work its magic—no kneading necessary. The process couldn’t be more simple, or the results more inspiring. 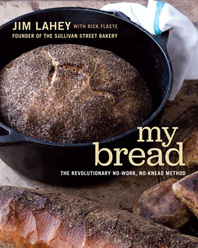 Here—finally—Jim Lahey gives us a cookbook that enables us to fit quality bread into our lives at home.